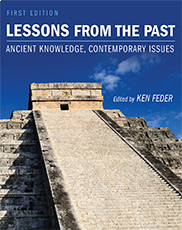 I have the honor to be included in Ken Feder’s new book – I have my own chapter | "Ever Widening Circle"
The anthology Lessons from the Past challenges the assumption that archaeology is little more than telling interesting stories about the past. Instead, the book details a variety of ways in which archaeological data and analysis can provide important insights concerning issues facing the world today. Lessons from the Past presents articles and case studies showing how archaeological methodology can serve communities of the descendants of excavated sites, and how the study of ancient ways of life can help reveal the origins of modern problems including climate change, hunger, and oppression and may even suggest some solutions. The book demonstrates how archaeology can contribute to solving historical mysteries, and the ways in which forensic archaeology can be used to help solve present-day crimes. Lessons from the Past is perhaps the first reader in the field to demonstrate the practical value of archaeology. By introducing readers to the diverse ways archaeology can be interesting, relevant, and even entertaining, the book serves as a valuable pedagogical tool for those teaching introductory courses in the discipline. Biography – Kenneth Feder holds a Ph.D. in anthropology, and is a professor of anthropology at Central Connecticut State University. He writes extensively in the field, and is noted for his criticism of pseudo-archaeology in the books Frauds, Myths, and Mysteries: Science and Pseudoscience in Archeology and Encyclopedia of Dubious Archeology: From Atlantis to the Walam Olum. He has appeared on the National Geographic Channel and the BBC, and is a fellow of the Committee for Skeptical Inquiry. Dr. Feder is also the founder and director of the Farmington River Archaeological Project.